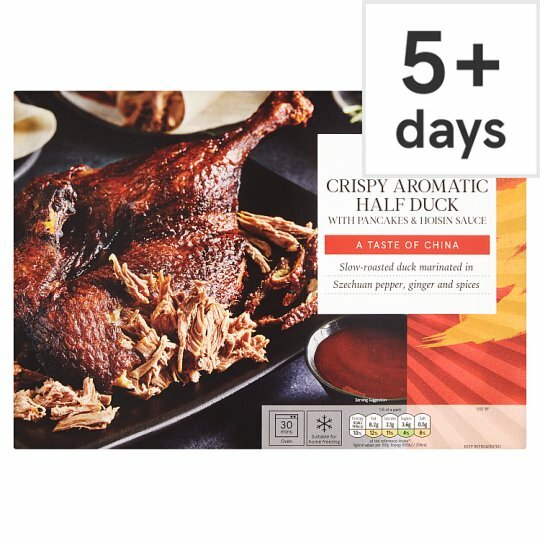 Half Duck (61%), Wheat Flour (Wheat Flour, Calcium Carbonate, Iron, Niacin, Thiamin), Water, Sugar, Rapeseed Oil, Potato Starch, Soya Bean, Salt, Cornflour, Szechuan Pepper, Ginger, Spirit Vinegar, Fructose Syrup, Molasses, Rice, Sesame Seed, Star Anise, Sesame Oil, Garlic, Cinnamon Powder, Clove Powder, Coriander Powder, Fennel, Bay Leaf, Allspice. Keep refrigerated., Packaged in a protective atmosphere. Instructions: Remove sleeve. Remove film, hoisin sauce and pancakes from tray. Duck - Oven 220°C/ Fan 200°C/ Gas 7 Leave duck in the foil tray and place onto a baking tray in the centre of a pre-heated oven for 25-30 minutes. Steam or microwave the pancakes. Place pancakes on a microwaveable plate in the packaging and heat on full power for 40 seconds (800W) / 30 seconds (900W). Hoisin sauce not suitable for heating. Caution: This product will contain bones.